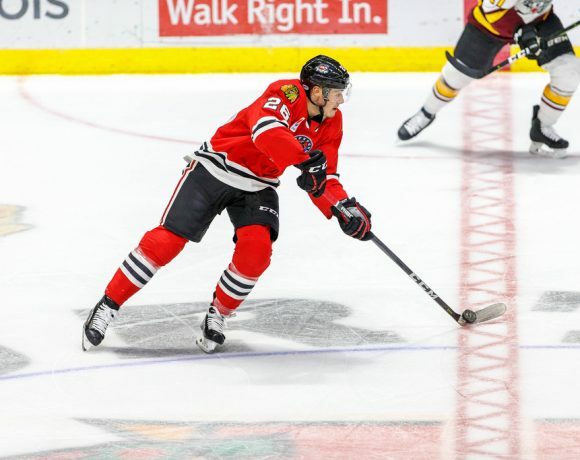 The Rockford IceHogs put a positive finish on what was a tough stretch for the Blackhawks AHL affiliate. 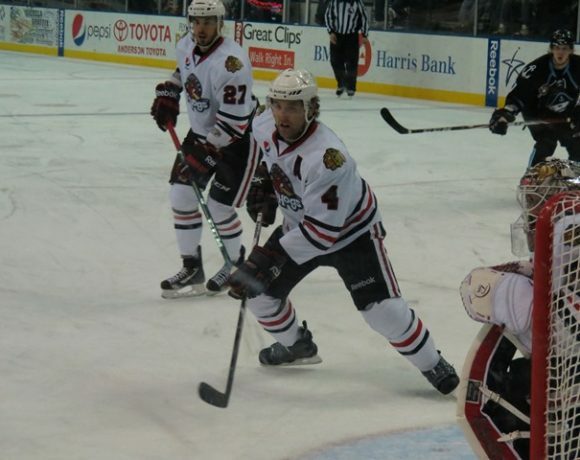 The IceHogs were blown out at the BMO Harris Bank Center by the Chicago Wolves to start a three-in-three weekend. Rockford recovered to take a point in Milwaukee before knocking off the Wolves Sunday at Allstate Arena. The win broke a six-game losing streak for the piglets and saw them hit the three-goal mark in a contest for the first time since November 10. Incidentally, Rockford defeated Chicago 4-3 that day in Rosemont. The IceHogs (9-8-1-4) are fifth in the Central Division standings with a .523 points percentage. They could move up the ladder this week despite being inactive until Saturday night, when they host Milwaukee. Grand Rapids (.556), just above Rockford in the standings, plays Iowa, Chicago and San Antonio this week. After playing ten of 13 November games on the road, the IceHogs will be settling in for a nice home stand to begin December. Rockford will be at the BMO exclusively for four games over the next two weeks. The Hogs visit Grand Rapids December 14, then return to Rockford for three more home games. The Hogs were 5-3-0-2 on the road in November. Oddly enough, home cooking did not agree with the piglets. Rockford lost all three home games played this month. With seven of the next eight at the BMO, hopefully the boys can reverse that trend. There are several players on the mend in Rockford. Terry Boadhurst has missed a couple of weeks now and would be a nice addition when he returns. Collin Delia (see below) tweaked his leg Saturday night and could use the time to be recovered for the upcoming home games. On Saturday night, goalie Kevin Lankinen was recalled to Rockford. Collin Delia, who played the third period Friday and the entirety of the Hogs shootout loss in Milwaukee Saturday, suffered a lower body injury that kept him from suiting up in Sunday’s game with Chicago. Lankinen backed up Anton Forsberg in that game. King hinted that Delia was being rested as a precaution. With nearly a week off, it would seem likely that he’ll be back in action this weekend. Also returning to the IceHogs was forward Luke Johnson. The Blackhawks re-assigned Johnson to Rockford Sunday. He started for the Hogs against the Wolves, potting the game-winner early in the third period. Johnson could be a spark for coach Derek King and the piglets as they enter the month of December. An alternate captain for much of his sophomore season in Rockford, Johnson will contribute at both ends as well as on both special teams. The Blackhawks sent Nick Schmaltz to Arizona yesterday. In return, Chicago received forwards Dylan Strome and Brendan Perlini. I wouldn’t expect either player to make an appearance for the IceHogs in the near future (both players are waiver-exempt). However, it wouldn’t be a stretch to think Strome might wind up in Rockford for a spell. Strome did play in the AHL for Tucson last season, putting up 53 points (22 G, 31 A) in 50 games for the Roadrunners. Perlini spent 17 games in Tucson back in 2016-17. He had 14 goals and five assists in his time in the AHL. Strome, in particular, needs to show he can utilize his skills at the game’s highest level despite a lack of speed. There are plenty of first and second-round draft picks bouncing around the AHL who can dominate offensively but lack the skill set to do the same in NHL rinks. Here’s hoping Strome, who is still just a 21-year-old kid, can make that jump with the Blackhawks. The losing streak reached five games as the visiting Wolves broke out in a big way against Rockford. Chicago took a 1-0 lead when Hogs starter Anton Forsberg lost track of the puck following a shot on goal by Reid Duke. Forsberg believed he had the shot absorbed by his pads, but instead the puck trickled next to him for Curtis McKenzie to guide into the Rockford net at 4:39. The IceHogs tied the game at the 8:25 mark with the teams skating four to a side. Anthony Louis took a drop pass from Jordan Schroeder along the left half boards, skated to the bottom of the left circle, and five-holed Wolves goalie Max Lagace. The game began to get away from Rockford late in the opening frame. McKenzie and Schroeder took simultaneous roughing minors and the teams played four-on-four for two minutes. By the time the two veterans came out of the box, it was 3-1 Chicago. Tomas Hyka made a slick feed to Zach Whitecloud coming down the slot; the shot got past the blocker of Forsberg, glanced off the left post, and put the Wolves up 2-1 at 17:07 of the first. Seconds later, Brandon Pirri went coast-to-coast with a Hogs turnover. The former Blackhawks farmhand capped off a marvelous play by going stick side on Forsberg at the 17:45 mark. The Wolves took a 4-1 advantage when Nic Hauge finished off an odd-man rush at 3:42 of the second period. Rockford closed to 4-2 on a power play goal by Darren Raddysh, who took advantage of a Viktor Ejdsell screen. At that point, the bottom dropped out of the IceHogs game. Chicago restored the three-goal advantage 35 seconds later, converting off a Blake Hillman turnover. Zac Leslie scored on a redirect for a 5-2 Wolves lead. Pirri fed Hyka in the left slot for a power play goal at the 12:11 mark, then Keegan Kolesar finished a 2-on-1 rush up the ice 18 seconds later to make it 7-2 Wolves. Collin Delia entered the game for Forsberg to start the third period. Rockford out shot Chicago 16-13 in garbage time, though neither team made a dent in the score over the last 20 minutes. Collin Delia turned away all but one of the 29 shots he faced, but Milwaukee’s Troy Grosenick was his equal in regulation and came up with the stops in the shootout. 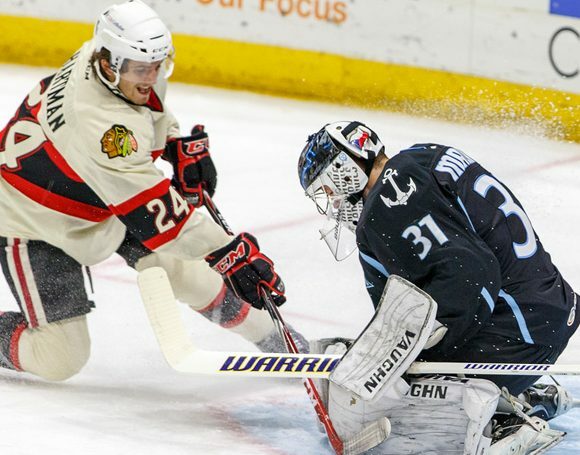 The IceHogs dropped their sixth-straight decision in frustrating fashion. Matheson Iacopelli was the recipient of a turnover by Ads goalie Troy Grosenick. Taking Grosenick’s outlet attempt at the right circle, Iacopelli fired into the vacated net at 3:03 for a 1-0 Rockford lead. Seconds later, Justin Kirkland got a shot on net that glanced off the stick of Andrew Campbell and trickled under the pads of Rockford starter Collin Delia. This evened up the game at the 3:44 mark. Both goalies shut down their respective nets through the remainder of regulation. Milwaukee had a two-man advantage in overtime after Tyler Sikura and Nathan Noel were sent to the box a minute apart. However, the Hogs held firm and forced the shootout. Anthony Richard and Kirkland beat Delia in the first two rounds. Anthony Louis was denied by Grosenick’s right pad; Viktor Ejdsell was stopped by his left and the contest came to an end. Grosenick, who made 31 saves plus two shootout stops, was awarded the game’s First Star. The Hogs avenged Friday’s blowout loss with a more focused effort, ending a six-game losing streak. 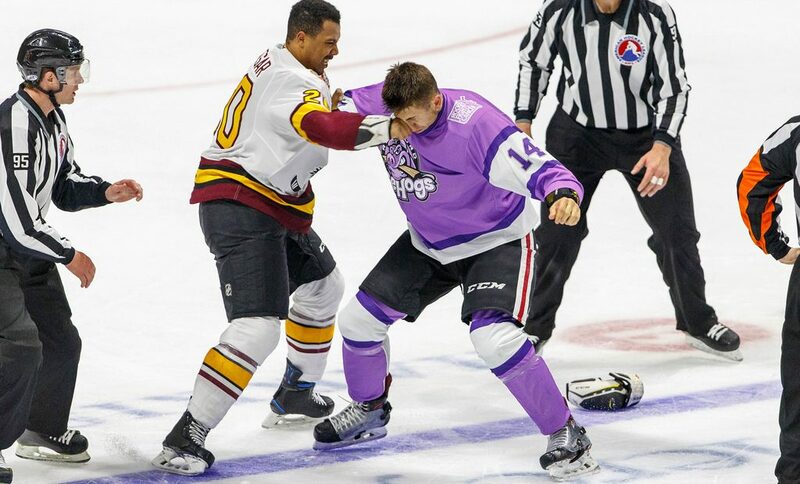 After killing off a pair of Chicago power plays early in the game, the IceHogs took a 1-0 lead on a Tyler Sikura goal. Sikura had set up Graham Knott at the right circle for a one-timer with an open net at which to shoot. Knott misfired and the Wolves cleared the zone. Sikura regained possession in the neutral zone, skated to the right circle and fired under the pads of Chicago goalie Max Lagace at 12:15. Following the subsequent faceoff, the Wolves came up with an equalizer. Gage Quinney out-maneuvered Luke Johnson coming down the left side and sent a centering pass to Tomas Hyka streaking to the left post. Hyka redirected the pass by Hogs starter Anton Forsberg and into the net to make it 1-1 at the 12:47 mark. The score stayed even until late in the second period, where the Hogs power play came up big. Viktor Ejdsell gloved a blocked pass attempt by Jordan Schroeder and brought it around the net to Anthony Louis. Louis waited it out at the right circle before hitting Ejdsell at the goal line with a pass. Ejdsell backed up a bit and went far side on Lagace to put Rockford ahead 2-1 at 18:50 of the middle frame. The IceHogs posted a big goal early in the third. The play started when Dylan Sikura was the first man to a loose puck in the neutral zone. He backhanded a pass to Jacob Nilsson as the center was crossing the Wolves blueline. Nilsson went across the ice to Luke Johnson, who was seeing his first action for Rockford since being sent down by the Hawks. Johnson sent a wrist shot from the top of the right circle that went past Lagace’s blocker and snuggled into the soft twine in the back of the Chicago net. The Rockford advantage was now 3-1 5:13 into the third. Chicago closed to within a goal with 4:24 remaining with Lagace on the Wolves bench and pulled him again with just under two minutes left. Despite losing three draws in the defensive zone, Forsberg and the Hogs were able to persevere and pick up their first win since beating Chicago back on November 10. Ejdsell, Chicago’s Reid Duke, and Johnson were named the three stars of the game. Forsberg picked up a measure of redemption with 26 saves after surrendering seven goals to the Wolves two days hence. Follow me on twitter @JonFromi for game updates and thoughts on the IceHogs throughout the season.